Do you work at The Talbot? First floor balcony and outside courtyard area open during spring and summer. What did you think of The Talbot? The Talbot is a great wee pub. Very pleasant,a bit upmarket but that's the Islington (De Beauvoir) periphery for you. At least you won't get any townies in. TIP: Great Vietnamese kitchen just moments away from the Talbot on Englefield Road. Do not go to The Talbot! I went with a few friends to a birthday party last Saturday night to be refused entry at 9.30pm as the pub was apparently "full" even though it obviously wasn't. They said that they were operating a one in one out policy but people kept leaving and they still wouldn't let us in. It was pouring with rain and the bouncer wouldn't even consider letting us keep dry under the awning. We asked to speak to the manager who came out and was completely obnoxious and annoyed that we had dared to ask to speak to him, so much that he informed us that we now wouldn't be able to come in at all probably because he was too busy being self important. The Talbot has just got new management, which is a shame as this used to be such a nice place to have a drink. I lived in De Beauvoir for three years and used to love visiting the Talbot as it was my local. The service was friendly and the atmosphere relaxed. However, I had a really disappointing experience the other weekend when I went to a friend's birthday meal there. Both staff (one possibly the manager?) who waited on our table were very rude - from the beginning of the meal, where we were told several times that we had to order 'now' because they had another table arriving in two hours (though this wasn't mentioned on the phone when the booking was made), to the end of the meal, where the waitress snatched money/credit cards out of our hands and told us unapologetically that she was in a 'rush'. Everyone enjoyed the food itself, although I ordered a vegetable stew (tomatoes, a few vegetables and a piece of toasted bread on top) which I thought was rather overpriced at £11.99. A disappointing experience. Went to the Talbot last week with some friends for Sunday lunch. Even though there can sometimes be a wait for food (possibly because they are unable to keep up with demand) it is still absolutely worth it. The meals were well priced, filling and delicious. Good selection of drinks as well as a friendly staff make this the ideal location for a roast with friends or family. We were so impressed that we are going back today for another helping. Wow -The Talbot has had the same owners & management for the last 2 1/2 years & we are still happily here, I are very sorry you were unable to gain entry as it is not our policy to refuse entry to nice polite customers. This review is only about my experience of the restaurant side of things, I only go for the food, I'm not trendy enough to hang round! What a menu, a chef who cares for all. My girlfriend is vegan and I'm a full blown meat eater, The Talbot caters for us both. On Saturday I had the pork tenderloin, served pink, very daring for most but perfect for me, whilst my girlfriend had the vegan sea, the only comment she made after leaving the plate empty was that was the tastiest vegan meal she had ever eaten. Go for the food and if your trendy do the bar, but if your a trendy foodie you will be in heaven. This pub is fantastic! I've had a great time every visit I've made here, whether it be for a quiet pint after work and read of the paper to a heaving weekend night when a good mix of the locals and east end hipsters are making the most of the busy but laid back vibe. But my favourite day of the week would be a Sunday session when I've popped down for a quiet lunchtime roast (awesome!) and Bloody Mary with a mate and bumped into more friends and somehow made a whole day of it because we were having so much fun. With so many friends and locals coming and going and having a good time you hardly notice the day go by. The food has always been terrific and the staff very attentive and welcoming. I even had my birthday party in the upstairs function room which was great with it's own balcony and everyone had a blast because we were so well looked after. Would recommend this pub to anyone (and their dog). You won't be disappointed. I visited the Talbot last weekend for the first time in years. I'm happy to say that it has much improved in terms of atmosphere and ended up having a great night, propping up the bar and having a real laugh with the landlord and lady - what a hilarious couple. A pleasant night followed by an unpleasant hangover but was able to take the edge off it the next day with a second trip back to make the most of the lovely pub grub on offer. Excellent - I have found my new local! I have to disagree with some of the reviews below, I LOVE THIS PUB! I go to the Talbot quiet often, sometimes during the weekends,more in the weekdays. Atmosphere is lovely, quiet and relaxing at the begin of the week, busy and funny on weekend: Djs plays a mix of 50's,60's,70's music, at a reasonable level, so I can groove around or have a chat with my friends without shouting. I love it specially on hot and sunny days, as they've got plenty of space outdoors, and in the backyard you can get table service as part of the restaurant. Food is sublime (trying their Sunday roast is a MUST!!) good filling portion with a great value for money. Interesting wine list and good selection of whiskeys. The restaurant area is quiet small, true that happens often in weekends to be asked by the manager to leave the table for the successive booking, but always with a good notice and we can always find a seat in the bar area, which include a second floor. I recommend it in weekdays, the staff is more relaxed and attentive, and they manage to find the time for a little chat with us, atmosphere is nice and service quicker. I forgot to mention that my little dog is always welcome, he always get a bowl of water and lots of cuddles from the staff, when in most of the places I go I get asked to keep him on the floor with a lead, or stay outdoors. I love the Talbot, great food and great service! Definitely recommended. I love the Talbot, Great food and great service! Definitely recommended! When the Talbot was re-hauled a couple of years ago, myself and many friends would go there frequently as the location was ideal and the pub in itself is lovely. a couple of years down the line, I'm sorry to say that due to the consistently rude staff - spearheaded by the manager who has a tendency towards a snide style of customer service - we are all well and truly put us off from ever wanting to spend any time there again. You're spoken to in a pretty hostile fashion, sometimes from the moment you step into the establishment, depending on what sort of unacceptable behaviour you are guilty of. The last time we went, it was walking into the dining area to say hello to a friend that caused the manager to feel the need to confront our need to do such an outrageous thing. There are so many pubs in the area that offer sunday lunches, food that is value for money, a cosy environment AND nice staff. In which case, there really is no need to support the endeavours of someone who blatantly dislikes customers to the point of straight up rudeness. Went to the Talbot for dinner last night with 3 friends & had a great meal, there was a buzz about the place for a Monday night & we were made to feel very welcome. The Rib-Eye steak I had was cooked to perfection & on the large side for under £16. This is a good little pub doing great inventive pub food, the publicans were even there working! (not just another faceless big chain). What ought to be a pleasant pub, nice and airy , good music, good beers, is spoiled by inattentive staff who seem far more interested in chatting to each other than listening to what you've ordered and serving you with any sense of wanting you to enjoy your visit. I've eaten here, the food was good- that time the waiter ( Canadian?) was good, but on my last visit the staff were so poor and rude, it really was my last visit. Friendly enough staff but the food was not worth leaving home for. We had winter veg stew, served in shallow soup bowls and in very stingy portions. The cheese and biscuits was pitiful – Crackers from one of those bog-standard variety packs from Poundland and cheeses (cut with a knife not cleaned between each one so remnants of Stilton on the Brie etc) tasting bland and unremarkable. A dollop of overly sweet jelly on the side and a stick of celery failed to impress. Together with a lukewarm pudding and a compulsory 12.5% service charge added to my bill I will not be revisiting this pub to eat any time soon. This is one of the best pubs in London, whether just dropping by for a drink or ordering food. The laid back vibe is perfect after a long day or for relaxing on a Sunday. The friendliest staff, simple but inviting decor, fantastic food and service and a small but brilliant selection of proper British ales; what more could you want. I couldn't disagree more with the bad review below, having eaten at this pub 5-6 times in the last 6 months, it has always been of the highest quality and well worth the price. I had dinner at The Rivington Grill last week and I have to say the food at The Talbot is better. In fact I've just talked myself into dinner at The Talbot tonight. This is one of my favourite pubs in London. It has excellent customer service and a feel good vibe. I was reading some of the reviews and it clear that they were written when there was a different management to who currently run the place. I highly recommend the Talbot. They have a good selection of games, a nice wine list and tasty bloody Mary's. What else do you need for a good old Sunday session. I love this place. I saw the review below and felt I had to post something as this is the worst case of a false review I have ever heard! This pub has the friendliest atmosphere of any of the De Beauvoir / Dalston pubs around. The staff are always extremely friendly, welcoming and always bring a smile to mine and my friends faces whenever we visit. The food is fantastic. The portions are not only generous but cooked as a roast should be, with good quality produce. You will be hard pushed to find a better value for money Sunday roast in such nice surroundings. If you are ever in the area I recommend that you treat your friends, yourself and your taste buds to this pub for not only great food but a well researched drink selection, with real ales, good wines, friendly staff and a welcoming happy atmosphere. see you there!! The service is appalling. Me and 7 other friends ate here for a Sunday Roast yesterday. When we went to order at 6 we were told no you cannot order we have already put an order of 5 into the kitchen and we do not want to overwhelm the chefs. I asked if we could just place the order now and have it come whenever they could? The Manager then said no I will come and find you. Half an hour later he came to take our order. We all had beef roasts as this was all that was left to order. When it arrived it was so bloody and rare it was almost mooing at me from the plate I like rare meat but this looked as though it had not been cooked at all. We all had little cups with about 4 teaspoons of gravy in it as this is all they had. I sent it back and asked if they could cook it a little more. When it returned it was still bloody and they had moved it onto another plate and returned it with no gravy and had taken some of the veg off as well. When the waitress asked at the end how everything was I said to rare her response with attitude was ‘well you should have sent it back then’ Shame, really nice Pub it’s very close to my house me and my friends always eating and drinking at good pubs. Won’t be returning here though. I ate here the other night then stayed for some drinks and have to say it was awesome. Never bother writing reviews but I had such a great experience I really wanted to let people know! We had the swordfish and the lamb...both came in under 10 minutes and were amazingly tasty! The girl serving us was really friendly and chatty and even whipped up a decent white russian for me. Me an some friends had a meal last night at the Talbot. Although i previously eat there this time the food was not very good at all. We ordered two Roast Beef dinners, Sausage and Mash and the Pasta with Butternut Squash. The Yorkshire Puddings that came with the Roast dinners were burnt, The mash was very lumpy and the past was very dry. When we mentioned this to the waitress all they said was that they would consider the feedback but they offered nothing else. The waitress did say that they had a trainee chef that night but we were not charged trainee prices for trainee food. I would advise that you need to find out who the chef is for the night before booking a table. I agree with the previous review... this place is great. The food is exceptional especially the massive Sunday roast and there always seems to be good DJ's on playing proper music. Not sure what has happened in the past but im a regular now. I know this bar has suffered in the past from poor management but i'm told from other friends that it changed hands sometime before Christmas. I live near by and use it regularly, mostly at the weekend and love the place! Its warm and welcoming, has an easy, laid back vibe and great staff. I've only eaten in the restaurant a couple of times but never been disappointed. The sunday roast is HUGE! Recommended.PS. They play great music there too....no chart rubbish. Myself and some friends spent last saturday night in this pub… the 19th July. My partner and I live on the same street as one of it’s (now former) sister pubs, the Birdcage, and the Three Crowns, and always enjoy ourselves in both these pubs so were confident that the Talbot would be along the same lines. Sadly this was not so. It looks pretty enough, nice cosy interior, great roof terrace (although no ashtrays outside… a bit odd). What really let this pub down beyond measure was the downright rudeness, sarcasm and snidey comments under not-so-hushed breath of the pub’s staff. Three members of staff were involved, including the DJ, a male and a female barstaff. Not one of them broke a smile from the moment we entered the pub. Let me make this clear… the place was DEAD, it was a saturday night, we were not being particularly rowdy but we were ordering very expensive drinks, rounds of cocktails and shots. They should have been happy to serve us. We asked for the barman to make us a round of a particular cocktail that we drink in the Birdcage. He had the ingredients, and any good barman would be happy and willing to try out a new drink. Instead this was greeted by jeers from the DJ, who said “amazing what people put together”, this was responded with “Amazing the twats that drink it” under the barmans breath. Well blow me, what a warm reception. Probably their best customers that week and that the reception they give us. Frankly we were disgusted and will NOT be returning. Can’t wait to tell our friends behind the bars in the Birdcage and Three Crowns, no doubt they will be pretty shocked too. The Talbot is my local and I love it! Opened just two years ago, The Talbot is a great pub with fantastic food, friendly staff and atmosphere. The owners always make us feel welcome and have created a great environment to spend a jolly afternoon and evening at the pub. The menu at The Talbot changes regularly but consists of good solid food of a high quality and great portions! The Talbot is my local and I love it! It opened just two years ago and The Talbot is a great pub with fantastic food, friendly staff and atmosphere. Caroline and Hugh (the owners) always make us feel welcome and have created a great environment to spend a jolly afternoon and evening at the pub. 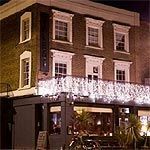 The Talbot is a popular pub in De Beauvoir Town that attracts a lot of local trendy types. The Talbot consists of a large white building that dominates the surrounding residential area. Whether you approach along Englefield Road from Hackney or Islington, it’s unmissable. The bar inside is decked out in shabby-chic furniture and the décor isn’t too unlike being in a bric-a-brac shop, with dusty table lamps, worn sofas and battered recliners scattered round the room. Some people think this adds to the charm, others that it’s a bit try-hard. Upstairs, the pub is surprisingly spacious with another large seating area (which is somewhat devoid of atmosphere if it’s not busy) and another room with one large dining table and several board games piled on top of it. There’s plenty of outside space here, too. The roof terrace is a great spot to people watch, or if you fancy sitting somewhere less conspicuous, there’s also a decent-sized back garden with picnic tables to sit on. The Talbot is something of an institution in Hackney and Islington for anyone who is under 30 and works in either art or the media. If you haven’t been in The Talbot for a roast and bloody Mary on a Sunday, you will probably have spent a Saturday night in here nodding your head to the DJ. You're unlikely to see the local grey-haired grizzly with his dog, but at the same time, it’s not so pretentious that you won’t fit in if you’re not a hipster. The Talbot attracts a cosmopolitan mix of people; you’ll hear accents from all over the world. At weekends the pub gets packed, so don’t expect to find a seat, although you might not need one as they have a regular DJ spinning tunes on Fridays and Saturdays from 8pm-12midnight. Sundays are also busy here when you can find many punters sipping bloody Marys and nursing sore heads. The Talbot offers a small but satisfying menu with above average pub fare. It offers a varied and interesting choice of dishes including the watermelon and feta salad (£5.75), spanakopita (Greek spinach pie) served with Greek salad (£10.75), or if you fancy something a bit more substantial, they serve Lincolnshire sausages and colcannon (£11). The portions have been known to be on the small side in the past, so choose something filling if you’re starving. The kitchen is open from 6pm-10pm every day. The Talbot has a decent but uninspiring drinks menu with two real ales on tap: Timothy Taylor and Doom Bar, both of which cost £3.40 a pint. Lagers on draught include Becks (£3.50, San Miguel (£3.70) and Staropramen (£3.90). A full wine list is available with the house red being the Spanish Terrazas Tempranillo (£4, £5.30 and £14 respectively). Meet your friends and while away the hours in this cool and interesting pub. It’s an N1 favourite.